Facile and rapid purification of DNA from varied sources can be performed using the Omni-PureTM series of DNA, RNA and plasmid purification systems. Each purification system has been formulated, optimized and designed to yield the highest purity available with the starting sample volume specially geared towards the desired downstream application. Routine mini-preps of plasmid extraction are made even easier with consistent performance. Purification can be performed with a maximum of 3 ml of cells yielding up to 20 µg of purified DNA. The convenient spin column method can be scaled up by using multiple columns and processed in less than 30 minutes. The purified DNA is of high quality suitable for all molecular biology applications including direct use in fluorescent automated sequencing methods. Replicates of plasmid purification using the Omni-PureTM Plasmid DNA Purification System. 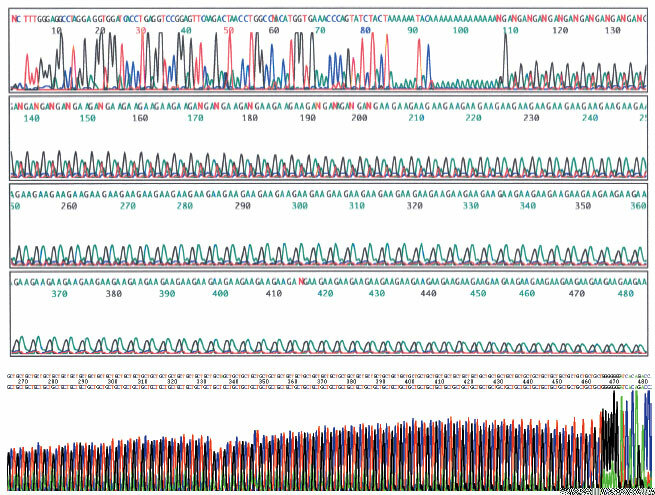 Friedreich's Ataxia Control DNA with 110 GAA repeats (top) and Myotonic Dystrophy Control DNA with 129 CTG repeats (bottom) sequencing electropherograms. These triple repeat sequencing requires ultra clean DNA. Plasmids were purified using the Omni-PureTM system and processed for automated sequencing.